The original floor plan for this home featured a small galley-style kitchen, that was walled in and separated from the living room—which had gone largely unused. 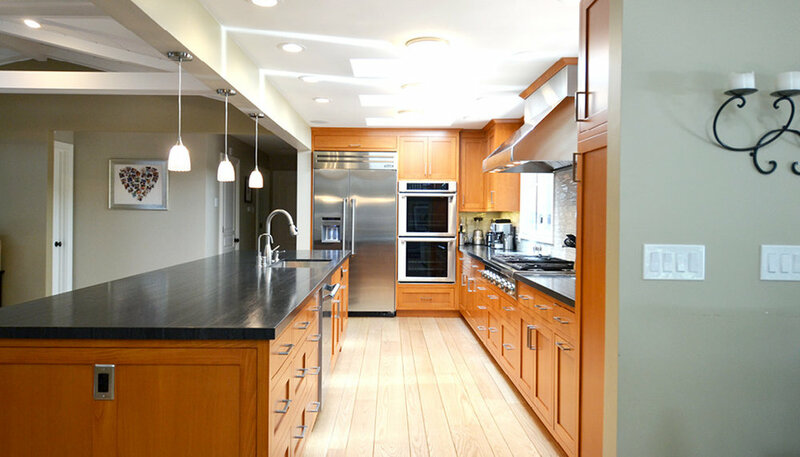 The owners wanted the kitchen to flow and complement the existing transitional design style and décor of the home, be spacious enough for several people to cook and socialize comfortably at one time, and to retain the existing hard wood floor for an integrated flow throughout all rooms. To achieve this goal we expanded the kitchen area into the existing living room by removing the wall separating the two rooms and creating one unified open space for cooking, entertaining, and everyday life. 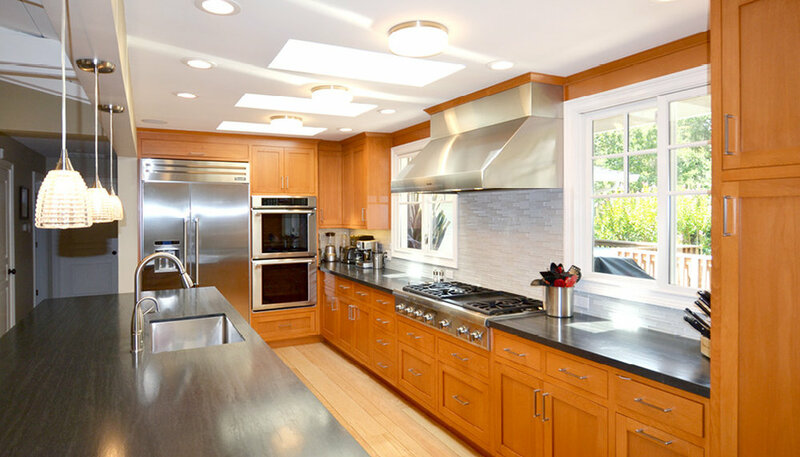 We installed professional grade appliances, an oversized island, and high end cabinets, lighting, fixtures and finishes. This home owner typically decorates with lots of bold colors. However; for her master bathroom remodel she decided to work with shades of white and French grey to create a tranquil escape for herself and her husband. Mixing patterns in the floor tile, marble counter top, and wallpaper, helps create texture and visual interest within the pale color palette. The owners of this house wanted to retain the cozy charm of their craftsman home, while simultaneously opening the space and improving flow through the rooms. We removed the wall separating the kitchen and formal dining room, opening up the space and creating an open floor plan. An oversized counter, with bar stools divides the kitchen and eating area. Beautiful white countertops, stainless steel appliances, and a pale grey color scheme keep the room bright and airy. French doors, which open to the deck and back yard living space, were installed in the former dining room. The original floor plan of this kitchen included four doorways, a fireplace, and an awkwardly sized pantry. There was too much going on! In order to create a more open and cohesive room we knocked down a dividing wall, close to where the sink is now, that originally separated the fireplace and pantry. We removed the chimney, which was located where the hood is now, and closed up one of the doorways. This really created more usable space for cabinets, storage, and appliances. The client played a major part in selecting the finishes for the room, including a stainless backsplash behind the range and Carrara marble for the countertops. 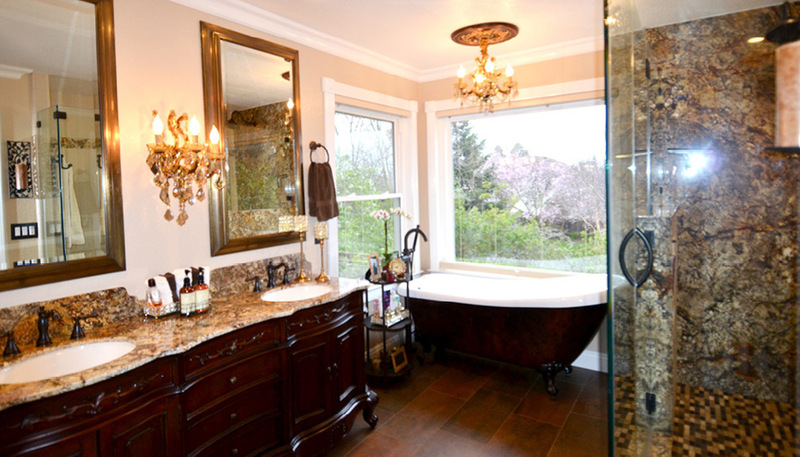 A beautifully elegant update and customization to a master bathroom built in the 1980’s. We maintained the original layout, improving the quality of materials and usability along the way. By enlarging the shower we were able to add dual controls and shower heads, making it generously sized for the homeowners.The original fiberglass tub was replaced with a classic clawfoot soaking tub. The vanity is custom built for the space and fitted with granite tops. This kitchen is full of many personal design choices that make it a sanctuary for the whole family. Previously there was a lot of wasted space within the cabinets and open walls. We maintained the original layout, aside from swapping the refrigerator from adjacent to the stovetop to across from it, while adding functionality with new cabinets and a wall shelving unit. The refrigerator door is flush mounted with the surrounding cabinetry, so that it blends seamlessly within the unit. The countertops are walnut sealed with varnish, the herringbone tile floor runs continuously through the kitchen, eating area, and into the family room. The farmhouse sink, brushed copper hardware, and exposed lighting all combine to achieve an elegantly rustic aesthetic. What a dramatic transformation! This open plan kitchen, dining, and recreation room was your typical 1980's building style—low ceiling soffits, brick surrounding the oven and archways, and fluorescent lighting. The effect was dark and almost cavelike. We installed new, wide plank wood floors throughout the entire bottom floor of the house for continuity. The kitchen was torn down to the studs and rebuilt with all new finishes—removing the elements that created darkness and really bringing in the light. 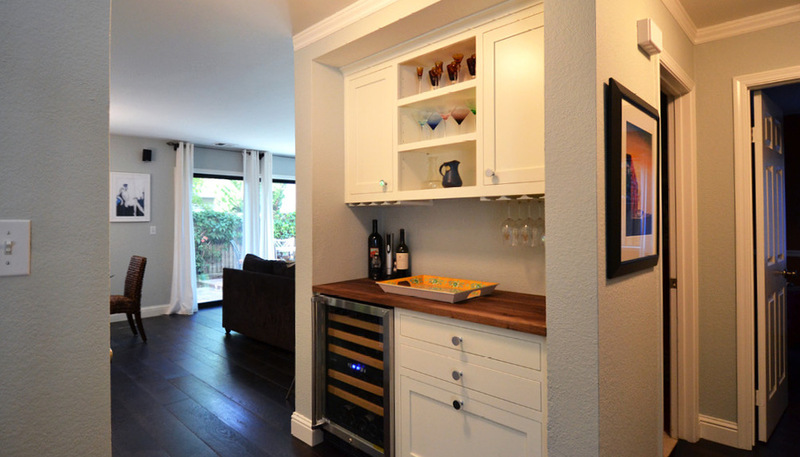 The clients chose to transform a previously unusable shelving area, in the walkway between the kitchen and the rest of the house, into their very own wine bar. In this home we transformed the outdated kitchen into a brand new, fully functioning heart-of-the-home. This was a full gut job—we tore down everything, straight to the studs, rebuilding within essentially the same layout. We installed new copper plumbing for kitchen, bath, and washer and dryer (bathroom and laundry are located through the doorway next to the refrigerator). As with many older homes, there were unusable areas of space within the old design that were eliminated to create new work areas and/or storage space. The new cabinets, stainless steel appliances, and cheerful red countertops really let the client express their personal style within their home. This home, nestled in the Claremont hills, is an original mid-century beauty. The client wanted to retain the style of her home, while updating some things to make her life easier. We laid new wood floors throughout the entire home. In the kitchen, we installed new cabinets with wood veneer to match the wood paneling throughout the rest of the home. Classic mid-century design elements like the mahogany trim at the top of the cabinets and flush inset doors with stainless pulls allow the kitchen to fit seamlessly within the style of the home.